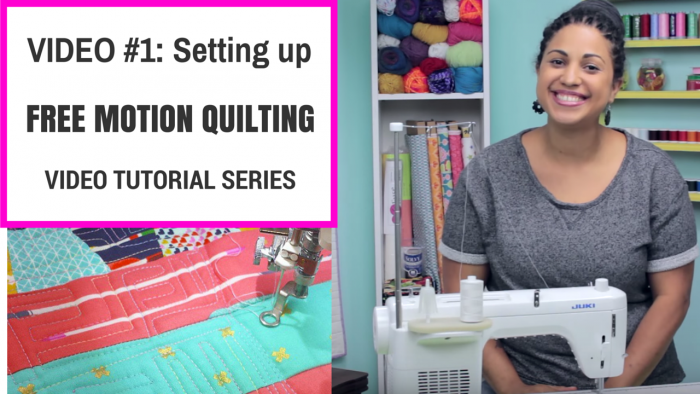 I’m kicking off a brand new free motion quilting video tutorial series on YouTube! I’m launching a new video tutorial series today! After so many of you have asked over the years I’m finally delivering! Here it is Video #1 in my NEW free motion quilting video tutorial series. 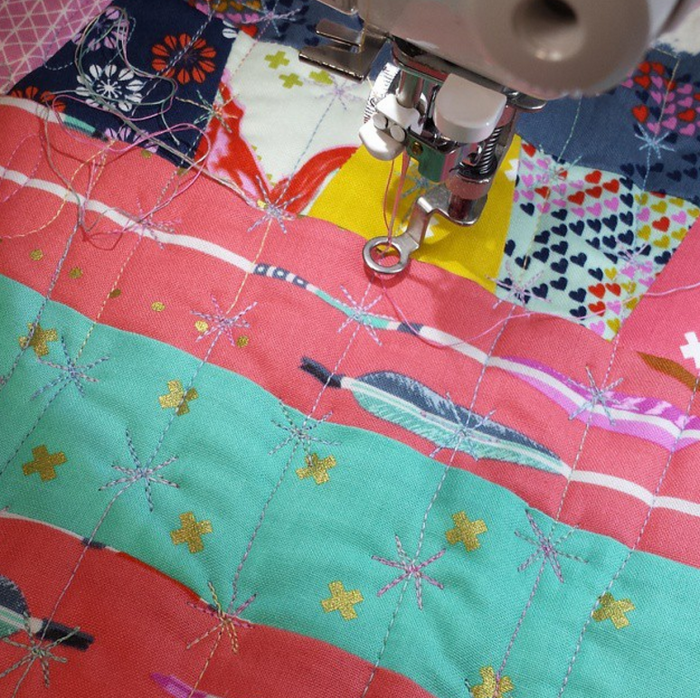 If you have quilty friends who are intimidated by free motion quilting forward them this link and tell them to join the fun! In this series of videos I will be showing you how I use a sewing machine to free motion quilt. Many of you know I have a longarm quilting machine and I usually will use that to finish my quilts. 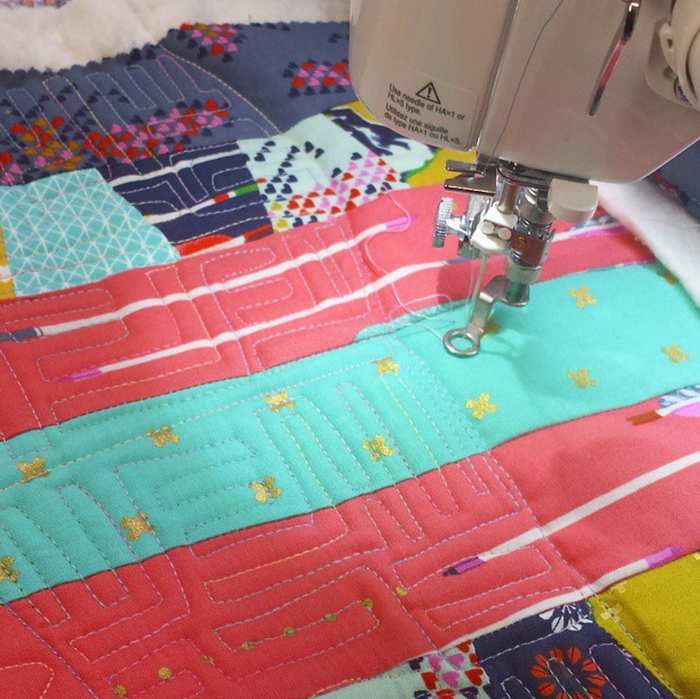 But since the launch of the Crafty Gemini Quilt Club in January 2015 I have been offering online video classes to my Club members on free motion quilting on a domestic sewing machine. I know not many people have a longarm machine or can afford to join my online Quilt Club so, I decided to branch out and offer my free motion quilting video tutorials in this new video series on my YouTube channel so it will be available for everyone, for FREE! Cool, huh? In this first video I talk about how I set up my machine for FMQ. I cover things like feed dogs, presser foot, lighting, thread, stitch length, etc. Some FMQ fun on a table runner I made earlier this year! I’ll teach you this design in future videos! It’s going to be fun! The next video will be up in a few weeks. Remember that I post videos on a lot of different topics so I have to alternate the content. A new free motion quilting video will be posted every 2-3 weeks on Mondays. Every Monday I’m posting a new tutorial on something fun so be sure to SUBSCRIBE to my YouTube channel so you don’t miss out on it! I also have a second YouTube channel called Crafty Gemini Creates and on that one you can catch a NEW video tutorial every Wednesday! That means you get two crafty video tutorials from ME every single week! Did you know that?! Don’t miss out on the crafty fun and use the links below! One of my favorite FMQ designs! So simple and mindless to do. I’ll teach you how to do it in future videos! Stay tuned! We are going to have a great time with this new video series and I hope you will join us! Great information! Looking forward to watching your videos for Free Motion Quilting. I have taken many FMQ classes, and I just can’t get the hang of it. I get frustrated, and then I pack everything up and put it away! I’ve lost count how many sample sandwiches I’ve used to try and regulate my stitch length. I can totally relate to your frustration Grace! I’ve used a supreme slider and used gloves to assist in the ease of pushing the fabric through and it still seems I have to use excessive strength and tension in my hands and arms to get the fabric to move through, even though the sandwich samples are much smaller than working with a large quilt! All the videos I watch have the appearance that they are having no trouble at all to do this. I’m hoping that these tutorials will result in some kind of information to help me master this technique, but I’m very close to giving up at this point! Many thanks to you Vanessa for taking the time to do all the videos you have. I find your instruction style very clear and easy to follow, so I’m keeping my fingers crossed re the FMQ!! !